Description Of Item: Apprentice to Gwildor, Jey often daydreamed of life as a member of the Masters of the Universe. His dreams became a reality when he was selected along with five other inventors by the science council to journey to Eternos to present his latest creation; the Photog Emulator. During the presentation, a slight miscalculation led to a flux overload merging Jey with his invention. Finding he could drain his enemies' powers and display their defeat on his chest, Jey called himself the Fearless Photog and was offered membership with his idols in the Masters of the Universe. 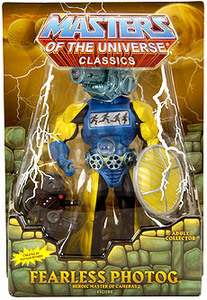 He fought heroically during the Second Ultimate Battleground helping to defeat several of Skeletors warriors, including Clawful and Whiplash. Photog drains his enemies power, displaying their defeat for all to see!